Jagex, the development studio behind the award-winning free-to-play fantasy MMORPG game, RuneScape, today announced a brand new online game based in the world of Gielinor – Chronicle: RuneScape Legends. 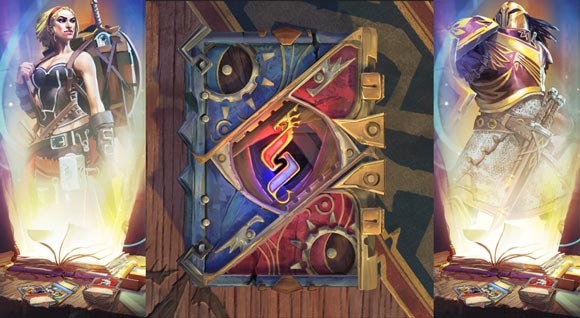 Currently a working title Chronicle: RuneScape Legends is expected to launch on PC, Mac, Tablet and mobile gaming platforms in 2015 as an exciting online collectible card game based around the detailed lore of the RuneScape universe. Exploring pages of a living book Chronicle: RuneScape Legends provides players with a heavy dose of quest building as they craft their own miniature heroes and characters from throughout the world of RuneScape before participating in intense, strategic, PvP combat. Chronicle: RuneScape Legends made its public debut this past weekend during the annual RuneFest convention, held this year at London’s Tobacco Dock. James Sweatman, the Lead Designer of Chronicle: RuneScape Legends introduced exciting fans to the game with some teasing screenshots and feature highlights. experience, but one still very much interwoven into the rich lore of RuneScape.